VICTORIA MALLORY made her Broadway debut starring as Maria in the Lincoln Center revival of West Side Story, and went on to play Lili in the revival of Carnival here at City Center. Miss Mallory originated the role of Young Heidi in the legendary Harold Prince/Stephen Sondheim production of Follies and followed that by creating the role of Anne Egerman in the Prince/Sondheim production of A Little Night Music, a show that won nine Tony Awards, including Best Musical of the Year. Victoria can be heard on those original soundtrack albums as well as Sondheim–A Musical Tribute and A Stephen Sondheim Evening. After running off together as Anne and Henrik in more than 600 performances of Night Music, Victoria married her co-star, Mark Lambert. Soon after relocating to California, Victoria became known for her starring role as concert pianist Leslie Brooks on the #1 daytime drama, The Young and the Restless. Concurrently she, as leading lady, graced the stages of the nation’s major summer stock and regional theaters. She also received an Emmy nomination for the CBS musical special, Singin’, Swingin’ and All That Jazz. For daughter Ramona’s formative years, the family lived at the top of the Rocky Mountains. Victoria became the director/ choreographer of numerous productions including: Side By Side By Sondheim; Yours Anne; The Wizard of Oz; and Joseph and the Amazing Technicolor Dreamcoat. She continued to do concert work and appear on television. Included were episodes of Everwood, Touched By An Angel, Promised Land, and the television movie The Unabomber. For more than 20 years, Victoria maintained a teaching practice coaching working professionals. She was a founding member and teacher at The Voice Studio in NYC. On August 30, 2014, Victoria succumbed to a short battle with pancreatic cancer at the age of 65. LARRY MOSS (Director) began his career on Broadway in Drat! The Cat!, Neil Simon’s God’s Favorite, directed by Michael Bennett, So Long 174th Street, The Robber Bridegroom and I Love My Wife. After teaching at Juilliard and Circle in the Square, he moved to Los Angeles and founded The Larry Moss Studio, where he directed and developed Pamela Gien’s The Syringa Tree, which won the Obie Award for Best Play, Drama Desk and Outer Circle Critics Awards, a Drama League Honor and a nomination for the John Gassner Playwriting Award. The Syringa Tree has played to sold-out houses worldwide. Moss also directed the TV adaptation for the Trio Network. He developed and directed Bo Eason’s Runt of the Litter, voted one of the top ten plays of the year by the New York Daily News and bought by Castle Rock to be made into a major motion picture. Off-Broadway, Moss has directed: Michael Raynor’s Who Is Floyd Stearn; Richard Kalinoski’s Beast on the Moon; Jack Holmes’s RFK (Drama League Award); Josh Jonas’s Capture Now; and Marcella Goheen’s The Maria Project. In Los Angeles he directed: April Daisy White’s Sugar; Richard Vetere’s How to Go Out on a Date in Queens; Richard Hellersen’s Dos Corazones (play and film); I Love My Wife starring Jason Alexander for Reprise; and John Patrick Shanley’s Beggars in the House of Plenty. He also directed the World Premiere of the new musical Jam starring Clint Holmes. He did a workshop of John Osborne’s Epitaph for George Dillon in New York for the first time in fifty years in 2008 and recently directed Remembering Bobby Short and This Thing Called Love starring Clint Holmes at the Café Carlyle. He directedCorktown by Jon Fazakerly in workshop at the Signature Theater in June 2012 and will be directing the films Relative Insanity and Chiseled. Moss coached Sutton Foster in Broadway’s Anything Goes (Tony Award); Helen Hunt in As Good As It Gets (Academy Award); Hilary Swank in Boys Don’t Cry and Million Dollar Baby (Academy Awards); Michael Clarke Duncan in The Green Mile (Academy Award nomination); Hank Azaria in Tuesdays with Morrie (Emmy Award); Jim Carrey in The Majestic; Tobey Maguire in Seabiscuit; Leonardo DiCaprio in The Aviator (Golden Globe Award and Academy Award nomination); The Departed (Golden Globe nomination); Blood Diamond (Golden Globe and Academy Award nomination); Shutter Island, Inception and J. Edgar (SAG and Golden Globe Award nomination). Moss’s teaching career includes U.S., Canada and Europe; he was one of the master teachers on Triple Sensation for CBC in Canada. His book on acting, The Intent to Live, was released by Bantam Dell in 2004. MICHAEL RAFTER (Music Director) wrote scoring and arrangements for Arthur (2011) starring Russell Brand, was the music supervisor for Broadway’s Everyday Rapture and worked on Sutton Foster’s National Tour. He was the Associate Music Supervisor for the Australian production of Jersey Boys and has traveled the globe with many Jersey Boys productions. Sutton Foster and Michael collaborated on her solo CDs Wish (2009) and Sutton Foster, Live at The Carlyle (2011). He also co-produced Norm Lewis’s solo CD, This Is the Life, and the recording of Tony Kushner and Jeanine Tesori’s Broadway show, Caroline, Or Change. Michael conducted Gypsy on Broadway starring Tyne Daly and won an Emmy Award for his music direction of Bette Midler’s TV version. Movie music credits include Music and Lyrics and Did You Hear About the Morgans? On Broadway, Michael has served as music director/conductor of Thoroughly Modern Millie, The Sound of Music, The King & I and Gypsy and did the arrangements for Swing and Sweet Charity. He was one of the two piano duos that played the Broadway revival of The Most Happy Fella. He has supervised Broadway and/or National tours of Thoroughly Modern Millie, Sunset Boulevard, The Sound of Music and The Buddy Holly Story. Off Broadway credits include Merrily We Roll Along and Violet. Michael was the music director/conductor for The American Songbook series at Alice Tully Hall, music director for Broadway’s Best on Bravo, where he worked with such artists as Trisha Yearwood, Kevin Bacon, Joan Osborne, Mandy Moore, Cyndi Lauper, Darius Rucker and Shawn Colvin. Michael is the co-founder of Destination Broadway, a summer theatre program for children 8-18 years old. Currently, he is working as music director/arranger for the upcoming revival of The Unsinkable Molly Brown. JOSHUA BERGASSE (Musical Staging) is the Emmy nominated choreographer for NBC’s new musical drama Smash, which in currently in its second season. Also for television, he choreographed a group routine for the top-10 dancers on Fox’s So You Think You Can Dance. Most recently he choreographed The Sound of Music at Carnegie Hall. Other choreography credits include: the off-Broadway production of Bomb-Itty of Errors; Captain Louie at the Little Shubert and York Theaters; the national and international tours of Fame the Musical; West Side Story at the Stratford Festival, Barrington Stage Company, Fulton Theatre and North Carolina Theatre; Guys and Dolls, Carousel, The World Goes ’Round also at Barrington Stage; Tarzan at North Shore Music Theatre; American Songbooks:Fascinatin Rhythm at Jazz at Lincoln Center. Bergasse has performed in the Broadway and/or national touring companies of Movin’ Out, Hairspray, The Life and West Side Story. JONATHAN TUNICK (Orchestrator) is the first orchestrator to have won a Tony Award; indeed he is one of very few persons to have won all four major American awards in entertainment: the Grammy (No One Is Alone, 1988); Emmy (Night of 100 Stars, 1982); Tony (Titanic, 1997); and Oscar (A Little Night Music, 1977). Additionally, he has received Drama Desk Awards for Passion, Titanic and Lovemusik, and has been showered with nominations: seven Tony nominations for Best Orchestration (Marie Christine, Follies, Nine, Pacific Overtures, Lovemusik, 110 in the Shade, A Catered Affair) and eight times for the Drama Desk (Baby, Into the Woods, Captains Courageous, Saturday Night, Follies, Elaine Stritch At Liberty, The Apple Tree, A Catered Affair). In 1982 he was given a Special Award by the Drama Desk. 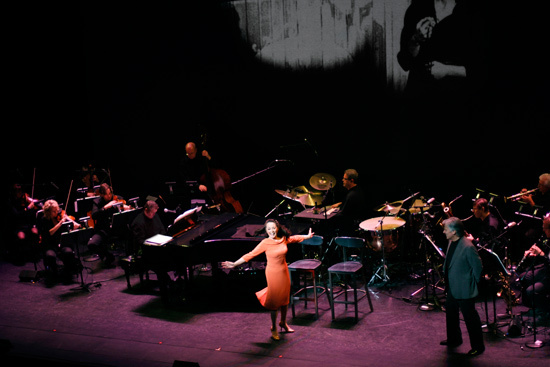 Although Tunick has been associated most closely with Stephen Sondheim (Company, Follies, A Little Night Music, Pacific Overtures, Sweeney Todd, Merrily We Roll Along, Into the Woods, Passion, Putting It Together, The Frogs), he has also worked with composers Charles Strouse (Dance a Little Closer, Nick & Nora), Maury Yeston (Nine, Titanic), Marvin Hamlisch (A Chorus Line), Michael John LaChiusa (Marie Christine), and many others. Tunick has orchestrated, re-orchestrated, or composed for nearly sixty stage shows, from Take Five in 1957 to the revival of Promises, Promises in 2010; thirteen films, from The Twelve Chairs in 1970 to Sweeney Todd in 2007 (including Blazing Saddles, Young Frankenstein, A Little Night Music, Fort Apache the Bronx, Endless Love, and Reds); and dozens of scores for television. STEPHENIE SKYLLAS (Producer & General Manager) and her company, Over~Sky Productions, foster, produce and manage various theatrical & performing arts projects. Stephenie is currently Producer & GM of RUBBLE, a new comedy by Emmy Award winning “The Simpsons” writer Mike Reiss and starring Bruce Vilanch and Jerry Adler. Other recent credits include general management of Fiorello, Superman and On Your Toes at Encores! ; producing Onward & UPward and The Chalkboard Trilogy for UP Theater Company; and Tales from the Tunnel Off-Broadway at the Bleecker Street Theater. Stephenie spent five seasons at New York City Center as General Manager that included fifteen Encores!, three Encores! Summer Stars (Gypsy with Patti LuPone, Damn Yankees with Sean Hayes & Jane Krakowski, The Wiz with Ashanti), A Gala Evening with Kristin Chenoweth and the Sondheim 80th Birthday Gala. Other New York credits include work at Roundabout Theatre Company, Richard Frankel Productions and Manhattan Theatre Club. Stephenie is on the Board of UP Theater Company and a member of Essential Voices USA with whom she’s had the joy of singing with The Muppets, at the Rockefeller Center Christmas Tree Lighting with Neil Diamond (broadcast on NBC), Carnegie Hall, Symphony Space, and recording “Mr. President”. CAROLYN WONG (Lighting Design) is a lighting designer whose recent New York productions include: She Dreams in Code and Lichtung (BAC, Liz Gerring); Charity (NYU, Tasha Gordon-Solomon); Yessified (PS122, Sally Silvers); Meg’s New Friend (Manhattan Theater Source, Mark Armstrong). History includes touring with Shen Wei Dance Arts, the Parsons Dance Company, Nai-Ni Chen Dance, Morphoses, Roxane Butterfly, Nejla Yatkin and the Rockettes Christmas Spectacular and assisting on the Broadway productions of Priscilla: Queen of the Desert, Oleanna, and Promises, Promises. She designs frequently for the Twin-Cities based company TU Dance (Uri Sands). She is an alumna and occasional guest lecturer of Oberlin College, and a native of San Francisco. TELEGRAPHICMEDIA (Projection Design) marks its debut in theatrical projection design with When Everything Was Possible, A Concert (with comments). The projection consists of animated black & white imagery from many of Broadway's brightest stars designed to complement the talented performances of Kurt Peterson and Victoria Mallory. Jesse Wiener (Composer) was born and raised in New England and is a New York based musician with a wide range of experience. A Harvard-educated composer, songwriter, singer, multi- instrumentalist, music director, conductor, producer, copyist, arranger, & orchestrator, Jesse has proven to be a uniquely versatile addition to the New York music and theater worlds. He has appeared on stage in a number of bands as guitarist, bassist, keyboardist and singer, as well as playing in the orchestra of theater productions such as White Noise in Chicago and as a sub on Broadway. He has served as arranger and prepared sheet music for the likes of Bruce Springsteen as well as multiple theatrical productions across the country. As a music director, he has conducted orchestras in such musicals as The Spitfire Grill, Cabaret and Sweeney Todd. His choral music has been heard across the country and his choral piece, Moral Courage, which was featured on NPR in 2011, will be published by G. Schirmer. He has also written musical theater and film scores.